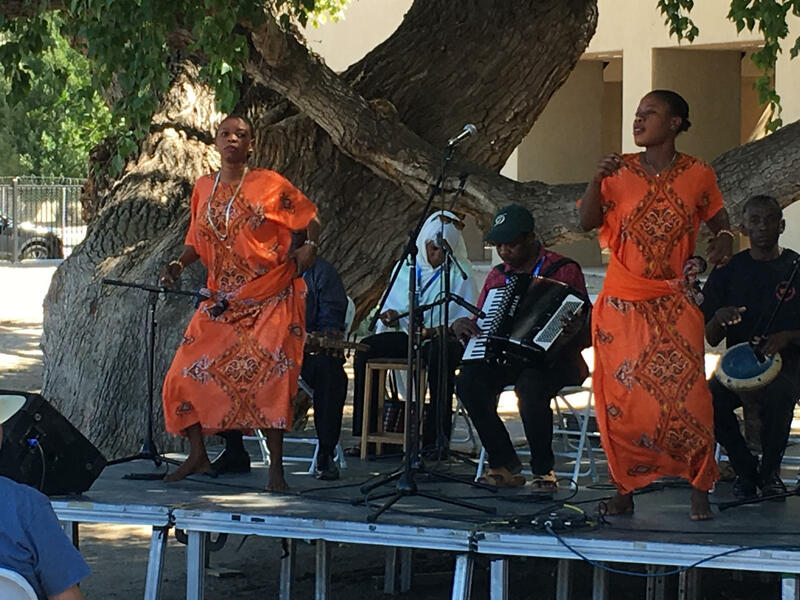 HPPR went to ¡GLOBALQUERQUE!, a world music festival in Abluquerque, New Mexico on 9/23 - 9/25. Given the eerie welcome from our drive into town, I had a feeling it would be spectacular -- and it was. Here's a rundown of some of the incredible artists featured this year, including exclusive photos and videos of the performances. For the full festival line-up, please see the festival's website. 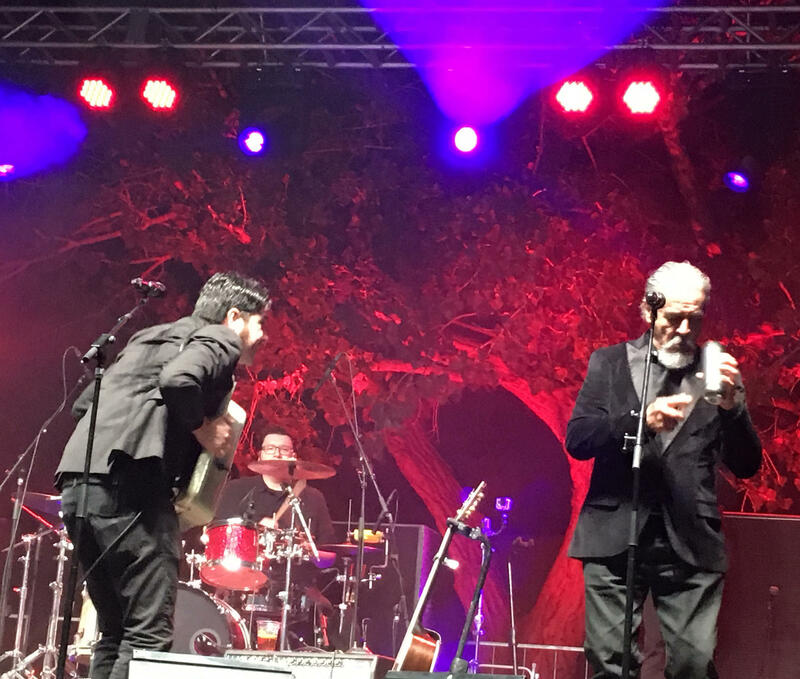 Orkesta Mendoza (Mexico/USA): Sergio Mendoza's simmering meltdown of Mexican mambo, psychedelic cumbia, ranchero, merengue, rumba, jazz and indie-rock springs out of the thriving, border-crossing music scene of Tucson, Arizona. The multi-instrumentalist was born in Sonora, Mexico and landed in Tucson in his teens. He formed Orkesta Mendoza in 2009 out of a one-off tribute project to the Cuban mambo king Perez Prado, which proved too much fun to stop. It's become a fast-paced “indie-mambo” big-band, sometimes extended to 19 pieces, centred around Mendoza's guitar, keyboards and energetic animation and the elegant figure and powerful baritone voice of singer Salvador Duran, dancing out rhythms atop his wooden stomp-box as the spirits of Perez Prado and Agustín Lara float in on clouds of lap-steel guitar, blown by clattering timbales, bursts of Mariachi horns and a rumbling rhythm section. "Though Mendoza bills the project as 'indie mambo,' he pours so much more into the pot, from psychedelic cumbia to splashes of merengue and ranchera—stretching each staple genre like taffy. As a result, the music isn't a museum-quality reproduction of eras past, but instead a living, breathing thing... As the crowd crammed into Webster Hall's tiny basement space to dance, the room fairly glowed with the band's shimmering heat." —NPR Music Watch Orkesta Mendoza live at Globalquerque (filmed by HPPR). Baladino (Israel): This Mediterranean folk band offers fresh, yet deeply authentic interpretations of Sephardic and Ladino melodies and brings this tradition back into full, fresh dialogue with its trans-Mediterranean past, using extended technique, subtle electronics and improvisation to dust off the predominant heavy-handed approach to Ladino music. With stunning vocals, unexpected instruments, and a pitch-perfect sense of arrangement, the Israeli group melds everything from Egyptian darbuka to Armenian duduk, from Ladino classics to rarely heard tunes, into a sonically vibrant, organic whole. 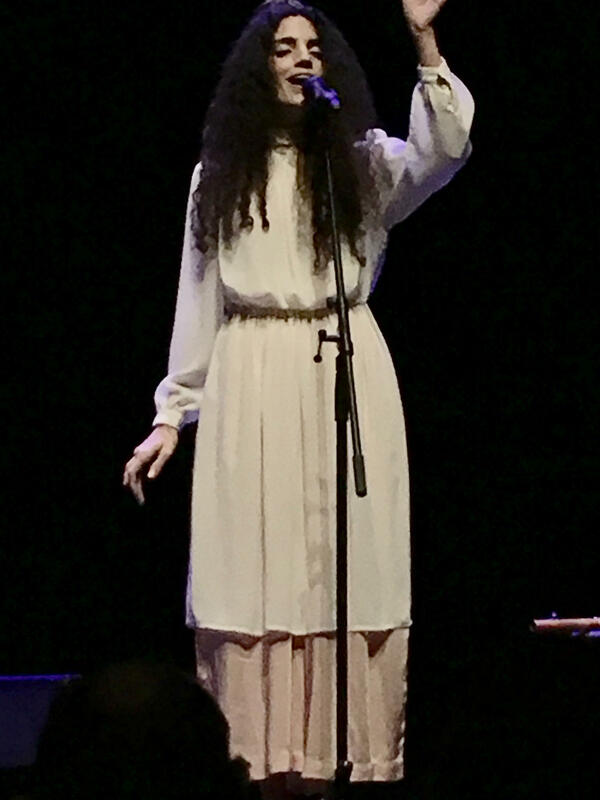 During Baladino’s live performances, songs often form a jumping-off point for instrumental improvisations driven by Mediterranean-Gypsy grooves, yet embracing rock and electronic influences. The name Baladino is a combination of two words which represent central themes in the ensemble’s vision. The first word, ”Baladi” means “land” in Arabic. The music played by Baladino comes from their homeland—Israel—a country comprised of Diaspora Jews who migrated from different parts of the world. These migrations have enriched the area and the musical influences from the Middle East, Europe and Africa became a major part of the culture itself. As Israelis born to immigrant parents, particularly from Middle Eastern countries, Baladino finds a deep connection to their parents’ countries of origin, musically and culturally. This is very significant to band members since, in many cases, they are unable to visit these places. The second word, “Ladino,” originated in Spain, and refers to both the language and the culture of Sephardic Jews who lived in Spain up until the 15th century. After the expulsion of the Jews from Spain in 1492, the Ladino tradition was cherished and kept and is still active in some degree in various communities to this day. The songs in Ladino the band performs come from this culture. Baladino’s modern take on this music is versatile and emphasizes the multiplicity embedded in Israel’s culture. Watch Baladino live at Globalquerque (filmed by HPPR); another video here. Anda Union (Inner Mongolia): This band's thoroughly addictive combination of Mongolian musical styles is a reflection of their roots. Hailing from differing ethnic nomadic cultures, the band unite tribal and music traditions from all over Inner Mongolia. Anda Union bring a wide range of musical instruments and vocal styles together in a fusion that Genghis Khan himself would have been proud of. Keenly aware of the threat to the Grasslands and their age old Mongolian culture, Anda Union are driven by their fight for the survival of this endangered way of life, by keeping the essence of the music alive. Anda Union all trained in traditional Mongolian music from a young age, many coming from musical families. They are part of a musical movement that is finding inspiration in old and forgotten songs. As a group they hold on to the essence of Mongolian music while creating a form of music that is new. Anda Union combine different traditions and styles of Mongolian music, developing a singular innovation. 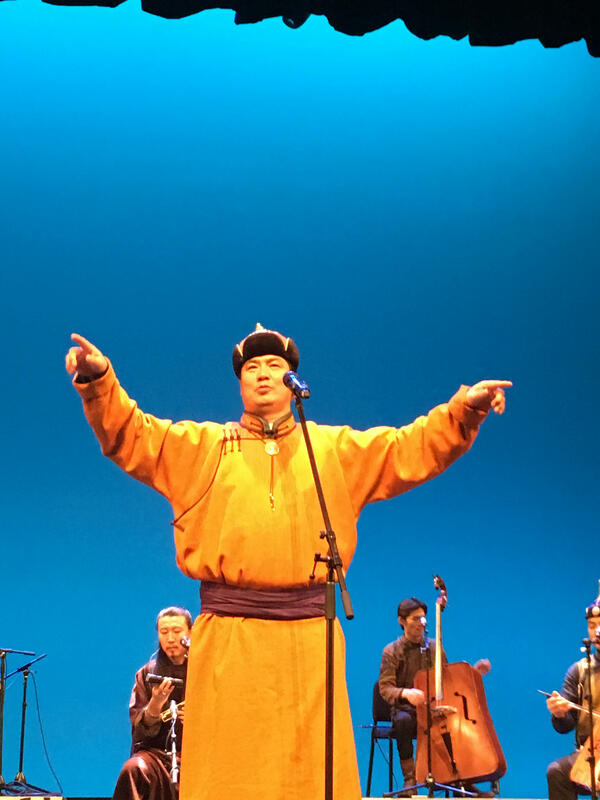 Driven by their thirst to discover the power and magic of the rich and powerful Mongol traditions and culture, they have been stunning people all over the world with their music for the last fifteen years. HPPR was quite taken with this group, so enjoy SEVERAL incredible clips from their diverse performance here, here, here, here, here, here, and here. Rajab Suleiman & Kithara (Tanzania): Tanzanian instrumentalist Rajab Suleiman threw caution to the wind. He took up the vexing, beautifully rewarding qanun, a zither with dozens of strings that features prominently in music around the Mediterranean and Middle East. What followed is renewing one of Africa’s syncretic wonders, the poetically allusive, melodically lush, and rhythmically sophisticated music of Zanzibar, the Arabic classical-meets-East African taarab. Suleiman can play striking renditions of Bach or jazz standards and has sat in with the likes of Taj Mahal, yet it’s his ingenious original pieces that are remaking taarab. The ensemble explores the subtle beauty of maqam, the system of modes and ornaments that drives Arab classical music, and pairs it with interweaving rhythms that feel distinctly African. Sensual dance rhythms unfold to startling virtuosity on instruments like the qanun and oud, violin and accordion. Earthy yet nimble vocals by local masters like Makame Faki and up-and-coming singers like Saada Nassar touch delicately on life’s most pressing, universal matters. See a them perform live at the Cottonwood Stage (filmed by HPPR); another video here. Supaman (Apsáalooke Nation): As a member of the Apsáalooke Nation, Supaman makes his home on the Crow reservation in Montana. The name “Supaman” hardly describes the person who is Christian Takes Gun Parrish, a humble Native American dancer and hip hop artist who has dedicated his life to empowering youth and educating listeners with a message of hope through culture and music. He is a young energetic entrepreneur with tremendous leadership abilities. His presentation style and delivery are nothing short of captivating. Known for his tremendously powerful inspirational lyrics, he is in demand nationally with the purpose of spreading a positive message throughout Indian country and abroad. In 2005 he won a (Nammy) The Native American Music Award for his group “Rezawrecktion” and has since released three self produced projects which have all received national recognition and awards, including the 2011 North American Indigenous Image Award for outstanding hip hop album. Christian’s presentation combines Native American culture, humor, and urban hip hop culture which dazzles audiences, captivates listeners and breaks down stereotypes. For this he has gained the respect of his culture and generation. 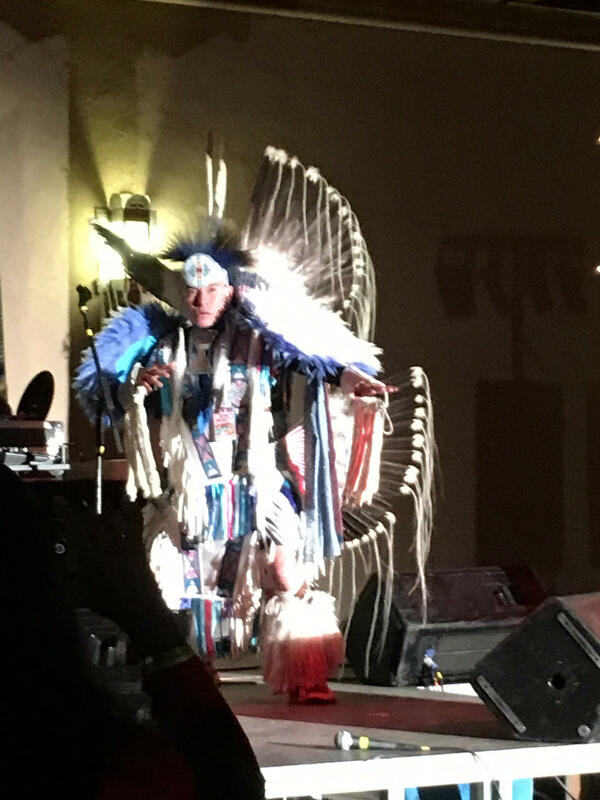 He is a champion fancy dancer traveling extensively on the powwow circuit throughout the U.S and Canada and lives a drug and alcohol free life. He also is a champion clown dancer and a Native American Flute player which adds to his uniqueness as a role model, not to mention a loving husband and father of three. The communicative talent, along with the compassion that exudes from his life, allows him to connect with people from all walks of life. His uncanny ability to motivate, encourage, and inspire through dance, humor and music keeps him at the forefront among his contemporaries. Supaman has worked with numerous programs and tribes to help promote self worth, build moral character, build a positive sense of native identity. See Supaman's live performance (recorded by HPPR). Mokoomba (Zimbabwe): Mokoomba is one of Africa’s most exciting young bands. Mokoomba hails from Victoria Falls in Zimbabwe and they are vibrant and distinct, combining their traditional Tonga and pan-African music cultures with dashes of Rap, Ska, Soukous and Afro-Cuban music. 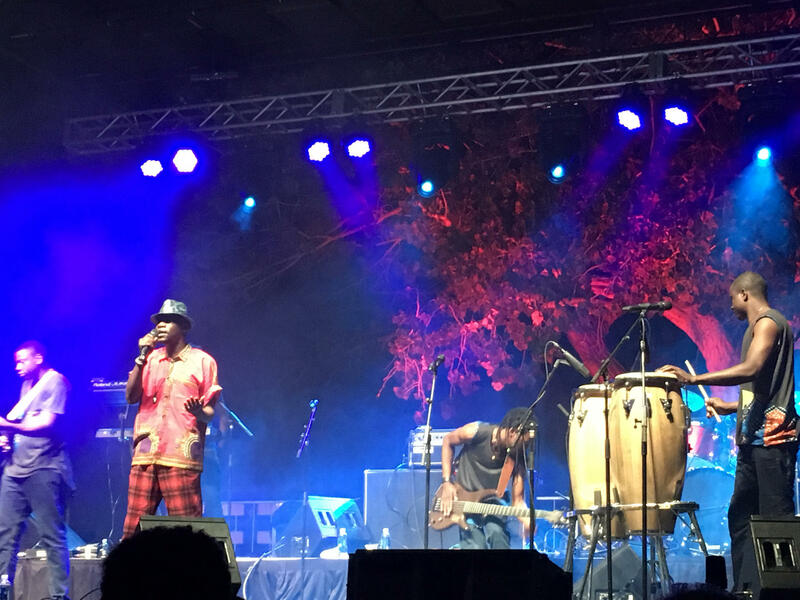 Since winning the Music Crossroads Inter-regional Festival Competition in Malawi in 2008, Mokoomba has toured more than 40 countries in Africa, Europe, Asia and Oceania, receiving critical attention for their recordings and numerous accolades. Mokoomba recorded its first album Kweseka-Drifting Ahead and the hit single “Messe Messe” as part of the Stand UP anti-poverty campaign funded by AfricaUnsigned in 2009. In 2011 Mokoomba and Gregor Salto released an EP titled Umvundla and in 2012 Mokoomba launched its second album Rising Tide, which has received rave reviews from world music specialists including UK’s prestigious Songlines Magazine, Froots Magazine, Afropop Worldwide and The Guardian, which listed Rising Tide in its top five world music albums of 2012. They are also subjects of a documentary called Mokoomba: From One River Bank To Another by Frank Dalmat and Francis Ducat, which tells the story of Mokoomba in the context of the relationship between culture and economic development in the south. Watch Mokoomba do their thing here and here -- plus, we caught an incredible dance breakdown (filmed by HPPR).